6 Cleveland Police Officers Are Fired Over Deadly 2012 Chase And Shooting : The Two-Way Last May, Michael Brelo was found not guilty of two counts of voluntary manslaughter — in part, because it was too hard to determine which shots had killed the pair. 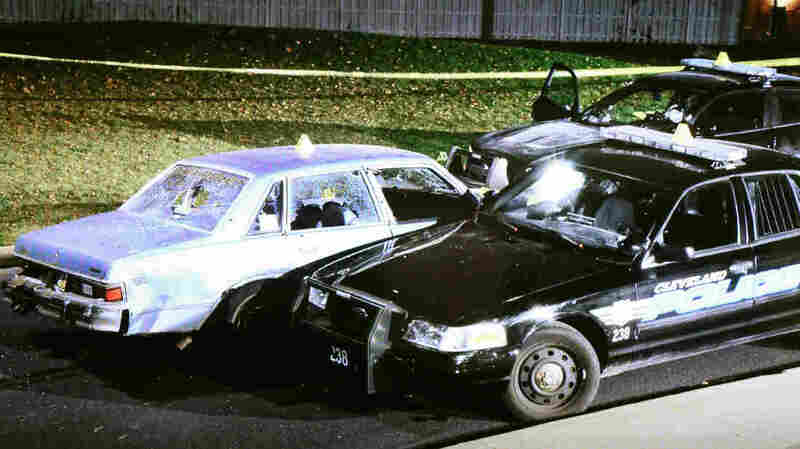 Cleveland police Officer Michael Brilo and other officers have been fired over the fatal shooting of the occupants of a car in 2012, seen here in a photo taken by the Bureau of Criminal Investigation. The Cleveland Division of Police has fired Michael Brelo and five other officers over their actions during a high-speed chase in 2012 that ended in the deaths of two unarmed suspects. Brelo was accused of jumping onto the vehicle's hood and firing 15 rounds through its windshield. The police chase ended in an outburst of gunfire that killed the two people inside the car: Timothy Russell and Malissa Williams. Last May, Brelo was found not guilty of two counts of voluntary manslaughter — in part, because, as Eyder reported for the Two-Way, it was impossible to determine whose bullets had killed the pair. Brelo and other officers at the scene were found to have fired 137 rounds in a span of 19.6 seconds. Investigators say he leaped from a police car onto the suspects' car after an initial fusillade of bullets. In addition to the six officers who were fired, six officers face suspensions that range from 21 days to 30 days; a seventh officer retired last year. Announcing the actions Tuesday, Public Safety Director Michael McGrath called the scenario "a very tragic event for all involved," especially for Russell, Williams and their families. The shooting quickly became a flashpoint in a national debate over police use of force, prompting protests and demands for accountability. The violence erupted after a pursuit of more than 20 minutes, when Russell's vehicle finally stopped in the parking lot of a middle school in East Cleveland, according to a police re-creation of the events of that night in November of 2012. The shooting came after a chase in which officers repeatedly said the people in the car had a weapon, were firing — and were perhaps reloading. Those claims were shown to be erroneous, and the police were criticized for several breaks with protocol during the chase, including a failure to avoid cross-fire situations in the fatal shooting. Presenting a re-creation of the chase and shooting Tuesday, Cmdr. James Chura, chairman of the Critical Incident Review Committee, played police dispatch audio that helped detail the circumstances. The scene he described was one in which officers were afraid for their lives, ducking for cover in the frenzied seconds of the shooting, and even reporting what they thought was return gunfire from the suspects' vehicle. Last year, a review of the car chase led officials to suspend 63 officers; some also received punishments such as a written reprimand. Reviewing the shooting Tuesday, the department announced that the 13 officers had been found to commit a range of violations, including: not requesting permission to join a pursuit; leaving the city of Cleveland without notifying dispatchers; taking and sharing unauthorized photos at a crime scene; and violating firearms safety protocols.